West House Farm Cottages Self-cateringSituated between Cockermouth and Maryport midway between Lake District National Park and the Solway Coast our luxury self catering accommodation offers the best of both worlds, lakes and mountains to the South and East and sandy unspoilt beaches and unspoilt coastline (AONB) to the West. Three luxury cottages in traditional courtyard setting. 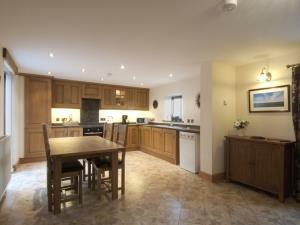 Bendale 4* lovely accommodation for couples, Little Meadow 5* barn conversion with en suite bathroom, sleeps 4. Old Byre 5* gold with outdoor hot tub. Within close proximity to West House Farm Cottages you will find a vast array of restaurants, pubs and cafés. Cockermouth gem town only 3 miles away has a wonderful variety of independent shops including butchers, bakers, iron mongers, green grocers, toy shops, beauticians, craft shops and interior designers. Within short travelling distance we can boast to have an indoor Go Kart arena, Maryport Aquarium, Senhouse Roman Museum, The Wave Centre, Dearham Heavy Horse Centre, a multi-screen cinema, Wordsworth House, Jennings Brewery Tour, Wellington Ice Cream Farm, Trotters Farm, Go Ape, Keswick with all its attraction, Mirehouse stately home, Honister Slate Mine. Travelling further a-field you shouldn't miss The Ravenglass & Eskdale Railway, Muncaster Castle, the Rum Storey, Tullie House Museum and a day at the races in Carlisle. Children welcome from any age. From the north and south, exit M6 at Penrith. Travel along A66 towards Cockermouth. At the first roundabout, continue straight ahead. At the next roundabout take the second exit for Maryport. A the next roundabout take the first exit for Maryport. Follow A594 trough the village of Dovenby, after passing the Dovenby Ship Inn take first right signed Dearham. West House Farm is 0.25 mile down this road on right hand side. If using SAT NAV our post code is CA15 7LD. On reaching your destination continue a further 200 yards and West House Farm is on the right. We liked everything in West Farm House as it met our expectations. we enjoyed the farm tour and appreciated the warmth and friendliness of the owners. Comparing this residence with other similar places, we believe it was an excellent value for money.